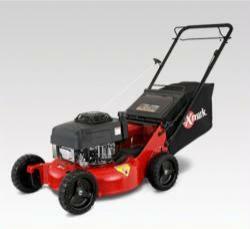 Exmark is an industry leader when it comes to mowing equipment, and Exmark lawn mowers are well known amongst professionals for their quality and durability, outselling all other brands. 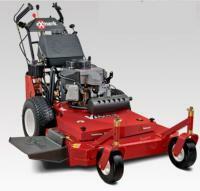 Home owners too benefit from the large range of residential mowing equipment. These lawnmowers are the preferred choice of many professionals and homeowners alike who want exceptional results in less time. 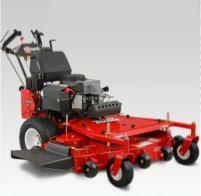 Models that are suitable for homeowners include the Commercial 21,S and X series, Metro, Viking and Turf Tracer. These are available in 21".26", 32",36", 48", 52", and 60", and depending on the model you have the option of a 'belt drive or hydro drive' and a fixed or floating deck. This is a real workhorse for a small machine, so don't be fooled by it's size. 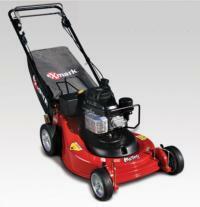 It's a heavy duty mower with a Kawasaki 180cc engine that is built to last, cutting efficiently and quickly. Having a uncomplicated design ensures that it has a lower number of parts which results in minimal maintenance, fewer breakdowns and no grease points. Why, even its height adjustment function is a breeze, doing away with the necessity for pivot-style adjusters. And as for the bagger, it’s easy to remove and put on, eliminating levers and hassle. All this means you have significantly less time emptying and more time mowing your lawn. Deck Style: Fixed deck, Rear -discharge bagger standard with option to mulch. Blade-Tip Speed Approximately 18,500 fpm. Whether you’re looking for a large walkbehind with all of the bells and whistles or something a bit more modest, this is the Viking model is the one to turn to.